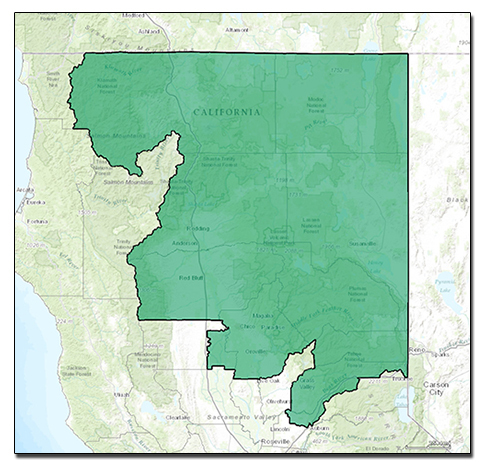 CD1 is located in northeastern California and includes the counties of Siskiyou, Modoc, Shasta, Lassen, Tehama, Plumas, Sierra and parts of Glenn, Butte, Nevada and Placer counties. It has a land area (28,000+ sq. miles), larger than ten States, including West Virginia. More than 99% of the land area is rural. Notable physical features include the Trinity Alps, Mt. Shasta, Lassen Volcanic National Park, the Upper Sacramento River Valley, hundreds of miles of the Sierra Nevada range, and the Feather and Yuba Rivers. Major urban areas include Redding/Anderson, Red Bluff, Chico/Oroville/Paradise, Nevada City/Grass Valley, and a portion of Auburn. CD1 is less ethnically diverse than California as a whole. About 86% of all residents are white. About 8% of CD1 residents are veterans. CD1 residents are, on average, older than the California average. 20% of CD1 residents are 65 years old or older. 35% of district residents have a high school diploma or less. 41% of residents attended some college, but do not have a four year degree. 24% of district residents have a bachelor’s degree or more. The median household income in CD1 is about $46,000 (half of households make more than this, half make less). The average household income is about $63,000. 38% of households in CD1 earn less than $35,000 per year and nearly 70% earn less than $75,000 per year. 19% of the people, including 23% of the children in CD1 live below the poverty line.